DUBLIN, IRELAND--(Marketwired - April 04, 2016) - Research and Markets has announced the addition of SNS Research's new report "The SDN, NFV & Network Virtualization Ecosystem: 2015 - 2030 - Opportunities, Challenges, Strategies & Forecasts" to their offering. Estimates suggest that service provider SDN and NFV investments will grow at a CAGR of 54% between 2015 and 2020, eventually accounting for over $20 Billion in revenue by the end of 2020. At present, virtualized EPC/mobile core, IMS and policy control platforms represent over 70% of all VNF (Virtual Network Function) software investments. Although the use of SDN is widespread in the enterprise and data center domain, service providers are only beginning to adopt the technology to programmatically manage their networks. Investments on orchestration platforms will account for nearly $2 Billion in revenue by the end of 2020, representing more than 9% of all service provider SDN and NFV spending. The growing adoption of SDN and NFV has created a natural opportunity for silicon and server OEMs to combine their server platforms with a networking business stream. 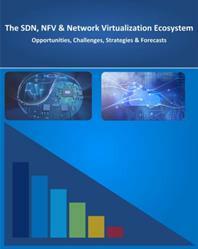 The report presents an in-depth assessment of the SDN, NFV and network virtualization ecosystem including enabling technologies, key trends, market drivers, challenges, use cases, deployment case studies, regulatory landscape, standardization, opportunities, future road-map, value chain, ecosystem player profiles and strategies.